With the AMH-DUT, you can use different dental tools with the tool holder, such as a dental mirror. Simply loosen the holder to remove or add a dental tool. The dental tool holder can also be rotated around the dental scope 90 degrees at a time. 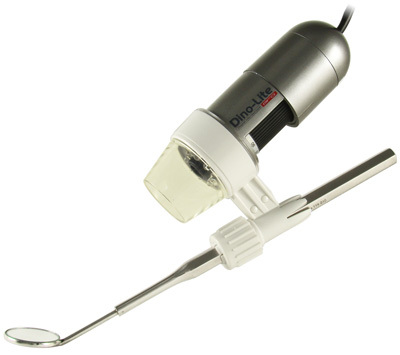 You may also use the AMH-DUT without a dental tool and use it as an external camera. Operation Systems: All Windows versions from XP, Mac OS X 10.5 or above.